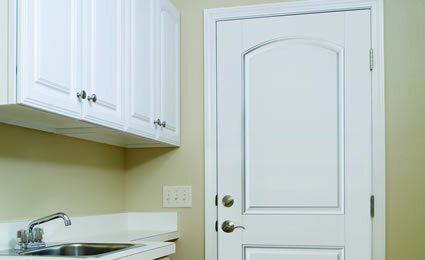 Therma-Tru’s fire-rated, fiberglass doors allow you and your family time to escape in the event of a fire. Made for entry to your garage, basement, utility room, and more, these fiberglass doors are designed to give you 20 minutes of protection from fire and are more impact resistant than wood doors. With a fiberglass, fire rated doors from Therma-Tru, you get a stylish look and great warranty without sacrificing safety. Our 20 minute fire-rated fiberglass doors are available in select door designs within our Classic-Craft®, Fiber-Classic® and Smooth-Star® collections making Therma-Tru’s fire rated doors the industry’s widest selection of styles and sizes to fit any architectural style.